Laser peels, also known as a laser resurfacing, is the removal of the top layers of the skin via focused laser light energy. 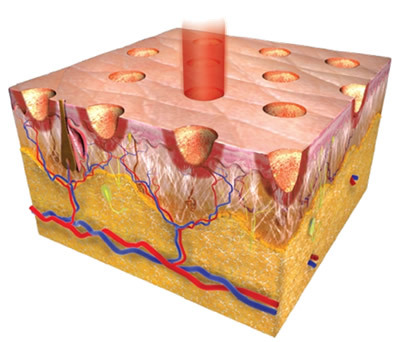 Some types of lasers may penetrate into deeper layers of skin to provide correction at a deeper level. Fully ablative laser resurfacing is used to remove moderately deep lines, scars, birthmarks and enlarged oil glands on the nose (rhinophyma). Laser resurfacing is usually performed using a Co2 (carbon dioxide) or Erbium laser, both lasers vaporize superficial, damaged skin cells. Laser resurfacing is an outpatient procedure that usually requires local anesthesia, and often done at the same time as surgical procedures. CO2 is thought to give the best skin tightening, unfortunately it also creates the most downtime, pain and risks of adverse side effects. Newer versions of CO2 lasers can use short pulsed light energy (ultrapulsed) or continuous light beams that are delivered in a scanning pattern to very precisely remove thin layers of skin with minimal heat damage to the surrounding structures. Erbium laser resurfacing creates minimal burning of surrounding tissue allowing for quicker recovery time than CO2 resurfacing procedure. Recovery time from the full coverage CO2 resurfacing is up to two weeks, compared to about one week with an Erbium laser. Erbium lasers cause minimal side effects, such as swelling, bruising and redness. Those with darker skin are usually a better candidate for erbium laser resurfacing compared to CO2. The Sciton MicroLaser Peel is partial to full epidermal peel ( typically, 20 – 50 microns). The Sciton Erbium Yag laser is used for MicroLaser Peels and has the capability to treat at depths as minimal as 10 microns to as deep as 120 microns (full resurfacing). Microdermabrasion generally only removes the stratum corneum (10 microns). This is a versatile procedure because the settings can be adjusted to control the depth of the desired peel, while a computer guided scanner ensures maximum precision and treatment uniformity. Because this treatment ablates deeper into the epidermis, it is perfect step between microdermabrasion and full resurfacing. Fractional resurfacing procedures have gained in popularity because their delivery systems dramatically reduce downtime compared to full coverage resurfacing. Fractional laser skin resurfacing treatments can utilize the same energy of an ablative resurfacing lasers, while providing the safety of non-ablative laser treatments. As a result, patients can undergo a corrective procedure, without the down -time. Fractional laser treatments target only a fraction of skin at a time, leaving the surrounding tissue intact, allowing the skin to heal faster. Fractional laser procedure are usually done in a series of treatments. Fraxel, ProFractioal and Ultrapulse (Active FX) are the most widely used fractional laser treatments. ProFractional is a Fractional Erbium Ablative laser. The UltraPulse fractional CO2 (10,600nm) laser system is capable of offering the full range of fractional resurfacing. The Active FX and Deep FX are both part of the UltraPulse Fractional laser, they are however separate handpieces that work differently. Patients are often confused by before and after photos, assuming they represent an Active FX treatment, when they may actually show results from a Deep FX or Total FX treatment. ActiveFX offers a large, superficial spot treatment. Total FX is a treatment that combines both the DeepFX and ActiveFX. Fraxel currently has four fractional systems. This is the most gentle option, and is a cosmetic procedure that treats minor skin damage, with little to no down time. The original and most popular Fraxel treatment, this treatment is used to resurface damaged skin and treat wrinkles around the eyes, acne scars, surgical scars, age spots/sunspots, melasma and Actinic Keratoses. There is minimal downtime , usually redness and some swelling. Most return to regular activities within a day or two. This is the most aggressive Fraxel treatment, it tightens skin, corrects severe damage, wrinkles, irregular texture, age spots/sunspots, sun-induced redness. There is increased downtime with this treatment, most return to routine activities after a week. This entry was posted on Sunday, November 21st, 2010 at 8:25 pm	and is filed under Laser, Skin. You can follow any responses to this entry through the RSS 2.0 feed. You can leave a response, or trackback from your own site. Just wish to say your article is as amazing. The clearness in your post is simply nice and i could assume you’re an expert on this subject. Well with your permission allow me to grab your RSS feed to keep up to date with forthcoming post. Thanks a million and please carry on the rewarding work.